In each of these areas, our anthology publishers give you the help you need, to make it easy to produce a high-quality printed and bound Student Anthology. Read through the next few paragraphs, and you'll have a better idea of what you'll need to do for student book publishing. You'll also see that this project can be a very enriching experience. There are many teaching opportunities available along the way, which can help develop everyone's creativity, including yours as a teacher! It can be great fun creating something permanent like a Student Anthology. Not only can it get the kids excited, but it can get the teacher and even the parents excited, too. And, of course, since we can print and bind your anthologies so quickly, your students won't have to wait long to see their work in print! There are several different ways to select YOUR writing prompts. And there's no 'wrong way' to do it. It's entirely up to you to decide which way might work best for your group of kids. Here is a list of over 100 different writing prompts. You can pick and choose from our list, use the entire list 'as is', or use it to jumpstart your own brainstorming session. Come up with a list of potential writing prompts, then whittle it down to a manageable length. (A) The teacher simply chooses a single writing prompt for all students to use. You can either choose from our list, or choose your own prompt. If all students are going to use the same prompt, you may want to keep it fairly vague, to encourage each student to interpret it in his or her own unique way. (B) The teacher narrows down the list of prompts to just a few (maybe three to five different prompts) from which each student would choose. This allows for more focused discussions and brainstorming within the class. (C) Let each student choose from a long list of prompts. It's up to the teacher whether to allow more than one student to use the same prompt. (D) "Draft Day." Some teachers assign a random draft order, and each student chooses his or her preferred writing prompt. Once a prompt is chosen, it is removed from the list. A great variation of this "Draft" is to allow up to 3 students to choose any one prompt before it is removed from the list. The Draft Day format helps to get your students engaged right from the start. For simplicity's sake, we're going to refer to the students' works here as "short stories", but they can really be any of a number of different art forms (i.e., poetry, non-fiction writing, paintings, drawings, cartoons, etc.). The rules that you set are entirely up to you. It's up to you how much time you allow between steps. For younger grades, you may want to only give them a day or two. For older grades, you may need to give them a week for some of the steps. Setting up your own in-class Peer Review Group can not only teach your students teamwork and cooperation, but also compassion and tact. And as the Teacher, you'll have an opportunity to see our future teachers, counselors, and leaders in action. This can not only help the individual writer whose work is being reviewed, but it can help the students who are doing the reviewing. Students take what they've learned from reviewing other works, and apply that knowledge to their own short stories. They're be more able to critique their own work after having critiqued other students' work first. You may want to break your class into smaller groups, and have each group read portions of a story, then critique it. The first time through, have them concentrate on the IDEA of the story, and the STYLE of writing. Does it make you want to read more? How can it be improved? Is it too long? Is it descriptive enough? Don't worry about spelling or grammar at this point. We'll work on them in the final editing. For younger grades, you can use a simplified version of Peer Review by reading selected paragraphs from each student’s work, then discussing them with the class. Does it make you want to read more? How can it be improved? Is it too long? Is it descriptive enough? Have Some Fun With "About the Author"
Have each student write a very short “About the Author” bio and include a headshot to be printed at the end of their short story. These can be funny or serious, whatever the student wants. Encourage them to include props in their photo, like a typewriter, fake mustache, pipe, jewelry, bust of Shakespeare, etc. Some students may spend a lot of time on the bio and photo, and be so proud of it that they work a little harder trying to perfect the short story itself. Have a "Book Naming" Contest -- Lots of Fun! At some point, have a “Naming” contest to choose a name for the Anthology. Sure, “Mrs. Snyder’s 7th Grade Class Anthology” is OK, but wouldn’t “Dinosaurs, the Louisiana Purchase, and Other Fun Stuff” be a little more creative? Get students to suggest phrases taken from some of the works within the anthology. Combine a few different phrases ... get creative. And, of course, you can always include “Mrs. Snyder’s 7th Grade Class Anthology” as a smaller sub-title. After all, your students may need a little reminder when they pull their copy of the anthology off of their bookshelves in 20 years or even 50 years. If you'll be including artwork (photos, drawings, etc. ), be sure to scan the artwork properly. For the best quality student book printing, scan the images so that, when they are enlarged or reduced to their final print size, they are 300 pixels per inch. First, determine the final print size of each piece of artwork. Then, simply multiply the width by 300 to get the number of pixels wide. For example, if you want a drawing to be printed 5 inches across, the scan file should be 1500 pixels wide (5 inches x 300 pixels = 1500). All scanners behaves a little differently, so you'll probably want to do a little experimenting with one or two pieces before jumping in and scanning all of the artwork at once. By spending a few minutes getting comfortable with the scanner settings ahead of time, you'll be saving yourself a lot of time and effort later. If you find that some of your artwork is a little lower than 300 dpi, don't worry about it. You can get away with resolutions of 225 dpi without any noticeable loss in quality. Your resolution can even drop to 150 dpi and it'll still be pretty good. At 150 dpi, if you look closely, it will start to look a little rough. A easy test is to view the scan at 200% on your computer screen. If it still looks good at 200%, then the finished printed piece should look good, too. Please note: While these instructions are for Microsoft Word, with only minor adjustments, they can be used for other word processing programs like Pages, Open Office or Word Perfect, as well as page layout programs like InDesign, QuarkXPress or Microsoft Publisher. Orientation: Portrait (meaning it's taller than it is wide). If you decide on a different page size, simply adjust the width and height above, but keep the margins at 3/4". And be sure that all of your students have the same settings. Then they can start writing their story. This will simplify the task of combining all of their Word documents into a single document before the student book publishing process begins. It's up to you whether you want to give each student free reign over font selection, font size, spacing and layout. Some teachers require each student to use the same basic formatting, while other will let the students use their own creativity in formatting their stories. Keep in mind that if a student uses a unique font, YOU will have to have that font, too, in order for it to print the way the student intended. If you want to have all students use the same formatting, you may want to design a master Word file and create styles for Title, Subtitle, Body, and maybe a couple of other kinds of paragraph. Then make copies of this master file and distribute it to the class. This doesn't guarantee that the students will keep the formatting, but it helps. For details on using styles, you can use Word's built-in Help feature (it'll either look like a question mark or a paper clip). And if you'd like even more in-depth training, we recommend the video training site, www.Lynda.com. They have well-organized, online training courses for Word, along with courses for hundreds of other popular programs. They usually offer a free 10-day trial, so you could get 10 days worth of training for free. Monthly subscriptions start at $25 per month, and you can cancel at any time. And they may offer educational discounts. We're not affiliated with them, but we like them so much that we use them ourselves. Here's where it can be a little tricky, but it's really not very difficult to do. First, try to determine ahead of time the order in which the stories will be printed. Then, open the first story in Word, do a 'File > Save as ...' and save it under a different name, something like 'Combined Stories,' and keep it open. Move the cursor to the bottom of that first story and add a 'Page Break', which will force the second story to start on a new page. Now, open the second story, Select All, Copy, toggle back to the 'Combined Stories' file, go to the very end, and Paste. Add another 'Page Break', then add the third story the same way. Do the same for all of the stories, poems or artwork, being sure to add a 'Page Break' after each one. Save frequently so you don't lose your work. After you've set up your file to the proper size, done all the formatting, and finished all those last-minute edits, you're ready to convert your file to a 'Print-Ready' PDF. Just follow our simple instructions below to assure that you'll get a trouble-free file. 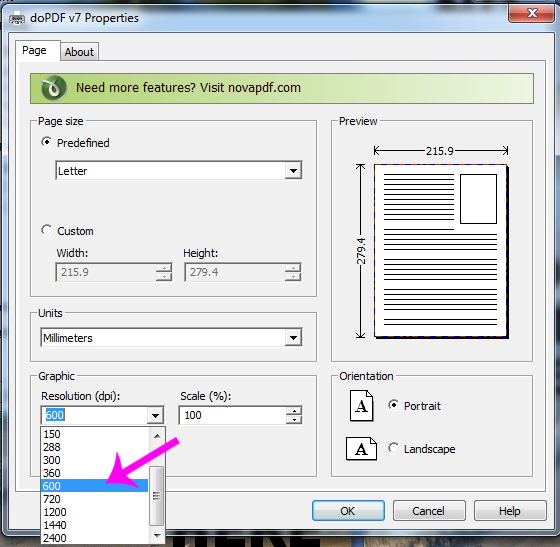 And be sure to look through the resulting PDF to make sure all of your page breaks and line breaks look right. If you're using a Macintosh, simply hit File > Print, and at the bottom left corner is a 'PDF' button. Click on that and select "Save as PDF ...". 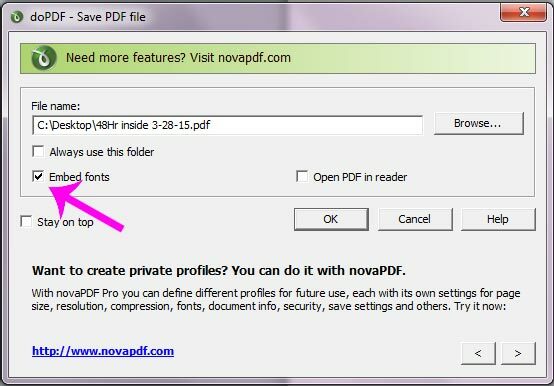 If you're using a Windows computer, we recommend using the free PDF converter called "doPDF" (available here). Once you have the converter installed on your computer, go to File > Print. 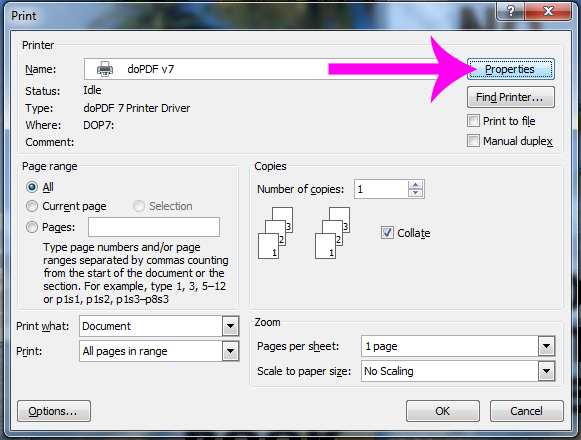 Make sure you choose "doPDF v7" as your printer, and then click on the "Properties" button. Another window will open up and in the bottom left corner you will see a drop-down menu labeled "Graphic resolution (dpi)." Change the resolution to 600 dpi and hit "Ok."
Very Important >> In the next window, be sure the box for "Embed fonts" is checked. You'll also want to pay attention to where you are saving this PDF file. It's usually easiest to save it to the Desktop, and give it a unique name like "48Hr inside" with today's date. This way, it won't get confused with previous versions. Be sure to select "Optimize for Standard Printing and Publishing" and make sure that "Minimum size" is NOT selected. -- Leather covers? Foil Stamping? It's Up to You! We're sure all of your students will want a copy, but they may want additional copies for grandparents, etc. Don't worry, though. We keep your student book publishing files stored on our servers, so you can easily place a re-order in the future. You decide what options you want. From our basic Perfect Bound (soft cover) books to our 'Top-of-the-Line' hardcover books with beautiful foil-stamped leather covers, all of our books are printed and bound with great care, and they look incredible. They're every bit as good as books that you'll see at your local bookstore. Start with our standard Perfect Bound books. Then choose from a long list of optional upgrades to produce a unique anthology that your entire class will be proud to show off. Here are just a few of our options, along with brief descriptions on ways we help students print their own books. Binding Options: Perfect Bound (soft cover) or Case Bound (hard cover). Full-color Pages: We can print black-and-whir, full-color, or a combination of both. 25 Free Books: Order 100 or more and you'll get an extra 25 books for FREE! Designer Covers: Choose form a full-color printed cover, or add some elegance by picking a cloth or leather cover instead. Foil Stamping or Embossing: You can foil stamp your title on the cover, or even personalize each copy by foil stamping a different student's name on each cover. Or emboss your title on the cover so it's raised up, offering yet another style option. Dust Jackets: Maybe you're torn between a full-color cover and a leather cover. You can have both. Simply order hard cover books with leather cover (maybe with foil stamping), and get a full-color dust jacket to wrap around it. It's the best of both worlds! Printed Proof: Get a single copy of your book first, to make sure it's perfect. Show it to your students (and maybe their parents, too). It's one last chance to find mistakes and fix them. It may also help parents decide how many books to order. Our customer service people can help you decide which (if any) of these options is right for you. They'll also give you pricing, help you with any questions you may have about student book publishing, and suggest ways to save money along the way. And the best thing is, we actually answer our phones. We're available weekdays from 8:30 am to 5:00 pm EST, and you can call (1-800-231-0521), email (info@48hrbooks.com) or chat online by clicking here. Here is a short list of writing prompts. As you'll see, if we only used the subject "American History", we can come up with dozens of ideas. Add a few other general areas of study, and this list can be used to jumpstart a discussion within your class to come up with other great writing prompts. History: Imagine that you were transported back in time to a period in American History. Knowing what you do about that event or that time period, what would you do? Would you try to effect any changes? If yes, how? And that's just American History. Here are a few teasers for other areas of study, as well as general topics. Start a discussion with your students. See how creative they can get in coming up with their own Writing Prompts. Science: Thomas Edison’s inventions, through the eyes of Edison's dog. Nature: Report on a student’s favorite wild animal. Fantasy: Short story that is futuristic, sci-fi, etc. Mystery: From Sherlock Holmes to Encyclopedia Brown, and anything in between. My role model: who they are, and why.